Changes opens with a secret so shocking and huge that it changes Harry’s life forever. IF YOU DON’T WANT SPOILERS – do NOT read the book blurb for this one! With this one big moment, events begin to unfold that change the face of the supernatural world forever. Duchess Arianna Ortega of the Red Court seeks revenge against the White Court for the murder of her husband, heating up the war between the two factions. The book closes in much the same manner as its opening… with completely and utterly jaw-dropping scenes that you will honestly wonder if what you just heard (read) was correct. But while the opening brought me joy, the ending irritated me. 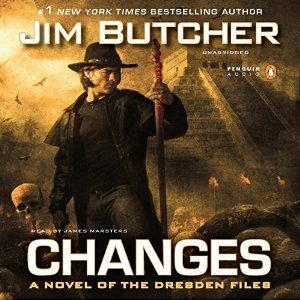 One thing I’ve appreciated about the Dresden Files is that, for most of the books, Mr. Butcher balances light with dark, and Changes is all about the light and dark within and around Dresden. For every high, there is an equal low. For every laugh, there was a sob. The emotional intensity of the story had me laughing out loud at times, while completely bawling at others. So much happens in the book, It truly is a game-changing title – one not to be missed. As always, Mr. Marsters brings to life the very essence and soul of Dresden. The intensity of Dresden’s highs and lows are perfectly projected. His performance had me weeping. I did notice one change: Marsters’s voice for Anastasia Luccio was more heavily accented and not as innocent sounding. Fellow listener, Melanie from Hot Listens, theorizes it is because Ana is no longer bespelled, and its her true self coming through after the body swap several books back. I like this theory! Changes is a gripping, emotionally-draining, utterly satisfying tale that sees the world around Dresden altered in many ways. It is a must listen (read) for fans of the series, with so many aspects of this fascinating world moving and changing before Dresden’s eyes.